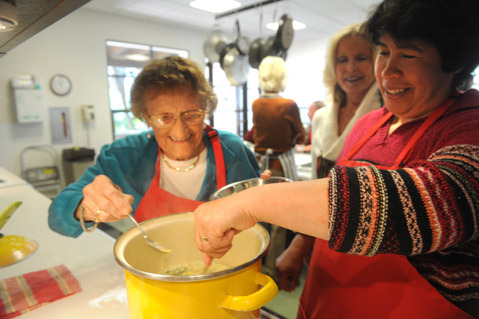 <b>LOSE VISION, KEEP COOKING:</b> The Braille Institute keeps folks like Idell Wenthur (top left) and Beatrice Ochoa (top right) confident in their kitchens. The institute’s director, Michael Lazarovits, recently answered a few questions about the program. See brailleinstitute.org for more details. Why is this program important? Often people think that if they are losing their sight, the kitchen is no longer a place where they can function safely. This dispels that myth. It uses a state-of-the-art kitchen to help people who are blind or visually impaired gain the ability and skills necessary to maintain a healthy diet, prepare nutritious meals, shop for groceries, organize and manage a kitchen, safely use knives, ovens, and other appliances while also learning how to handle kitchen emergencies to avoid injury. Confidence and self-sufficiency is the purpose of this class. Once a person regains their confidence, they can then become more self-sufficient, they can then regain their dignity, and then they will continue to live, happily and independently. What is taught? 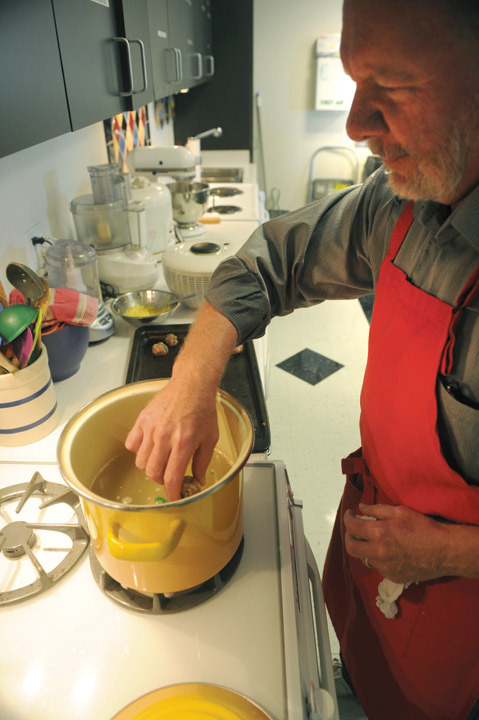 We teach basic kitchen skills, such as cutting, slicing, dicing, measuring, grilling, frying, sautéing, and more, and use techniques specific to those who are blind and visually impaired. We also identify various foods, seasonings, and spices using a person’s sense of smell and touch. Nutritional information is also taught, focusing on those foods that help prevent and slow the progress of various eye diseases, such as macular degeneration and diabetic retinopathy. How many students are dealing with recent vision loss? The majority of the people who come to us are experiencing various types of vision loss for the first time. Averaging 78 years of age, most have had good eyesight for their entire life. When they get to the point where their ophthalmologist informs them that their vision can no longer be corrected by glasses, they come to us. What are some popular dishes? South Indian eggplant curry, pad thai chicken, Moroccan quinoa stew, and the spicy shrimp and vegetable stir fry.